Topics: Franchise Opportunities, Choice Of Carriers, Fedex, and Usps. The site has about 374 users daily, viewing on average 1.90 pages each. annexbrands.com About Annex Brands : Annex Brands, Inc. It is hosted by Godaddy.com Inc (Arizona, Scottsdale,) using Apache web server. ns74.domaincontrol.com, and ns73.domaincontrol.com are its DNS Nameservers. 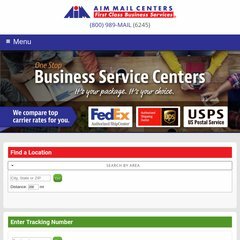 Aimmailcenters.com's server IP number is 50.63.208.1.